Description: Starting at the old ranger station at the base of lookout mountain (driving directions below) bike along the road a short distance till the junction for FS road 22 and 42. Take a left here on 22 towards Walton Lake. Follow this road for about 7 miles. Take the first left after the Walton Lake Campground. Round Mountain Trail #805 begins here. Climb up through old growth ponderosa pine stands and open mountain meadows to almost the summit of Round Mountain. Continue on the gravel service road down till the trail marker to Round Mountain South Trailhead. Take a left here. Follow this single track down till the intersection with FS road 42. Take a right on FS road 42 and follow the road back to the old ranger station parking lot. For a longer loop continue on the trail on the other side of road 42 instead of turning right. This will pop out at Round Mountain South Trailhead. Continue up the dirt road until a parking area with three different trailheads. Take the middle trailhead (Mother Lode Mine #808A) to the summit. Then continue 7 miles down to the car on Look Out Mountain Trail #804. Be careful take the #804 trail that continues along the ridge line instead of #804 which drops back down towards the Mother Lode Mine Trailhead. With this addition the bike ride would be around 32 miles. Directions from Bend: Begin on US-97 N toward Redmond/Portland. Continue on US-97 N for about 15 miles. Turn right on OR-126/SE Evergreen Ave. Follow OR-126 for about 17 miles. OR-126 becomes NW 3rd St/US-26 E. Continue on US-26 E for about 13 miles. Turn right onto County Road 123 and continue for about 7.5 miles. The trailhead is on the right with a pullout for parking. The pullout is just before the turn off for Forest Service Road 22 and 42. Description: This ride goes through Prineville up towards Steins Pillar and then back out along the Ochoco Reservoir providing views of the Ochocos and Steins Pillar along the way. This is a road and gravel ride. Start at the Crook County Fairgrounds and go north on Main St which turns into NE Mackay Creek Rd. Continue on this until the road intersects with Mill Creek Rd. Stay right onto Mill Creek Rd and follow this until it intersects with Hwy 26. Take a right here and continue along the highway to Prineville. In Prineville take a left on 380 and then a right on SE Lynn Blvd. Finally take a left on Main St. and follow to the car. Directions from Bend: Begin on US-97 N toward Redmond/Portland. Continue on US-97 N for about 15 miles. Turn right on OR-126/SE Evergreen Ave. Follow OR-126 for about 17 miles. OR-126 becomes NW 3rd St/US-26 E. Take a right on Main St and park along the Crooked River Park. 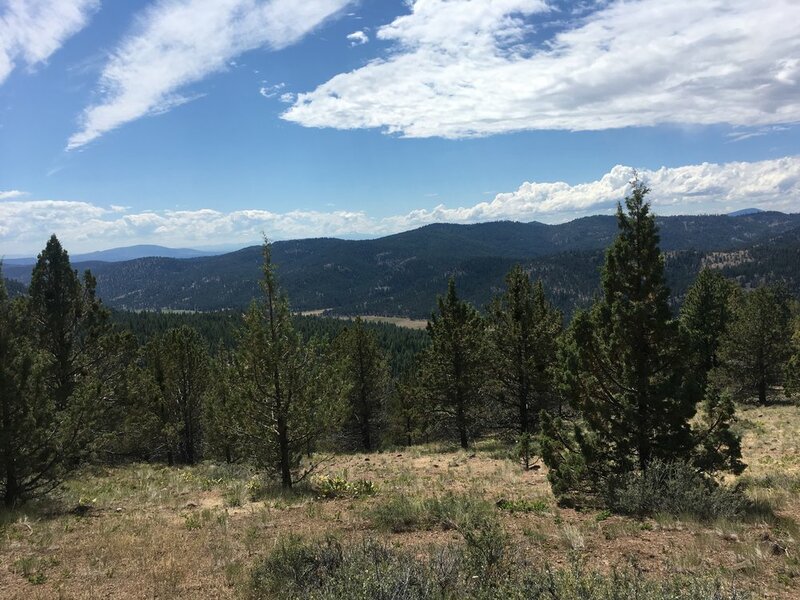 Description: This trail is located on the north-western side of the Ochoco National Forest and follows road #835 for 4.5 miles to Cougar Creek. After 1.5 miles the trail intersects road 550: continue north on the road for 300 yards and the Cougar Creek trail will resume on the left. After reaching the top of the butte the trail briefly cuts across a gravel pit along road 2730. The trail winds down an additional mile before reaching Cougar Creek. The trail traverses up and down Cougar Butte where sunlight is filtered by a diverse composition of pine and fir trees. The beginning of the trail winds through the Bailey Butte burn of 2014 and parallels Heflin Creek. The trail ascends through lush vegetation around Dodds creek and ponderosa pines dominate the eastern side of the butte. There are plenty of opportunities to stop in awe at the rolling landscape visible through the trees. After reaching the top of the butte, the trail descents through dense fir trees to Cougar Creek. Upon arrival at Cougar Creek, take a break to enjoy the multitude of deciduous trees lining the water before continuing up the same was as coming down. For an extended bike, continue past Cougar Creek for 3 miles to reach the Cougar West Trailhead that connects to Scotty Creek Trail #838. Directions from Bend: Begin on US-97 N toward Redmond/Portland. Continue on US-97 N for about 15 miles. Turn right on OR-126/SE Evergreen Ave. Follow OR-126 for about 17 miles. OR-126 becomes NW 3rd St/US-26 E. Continue on US-26 E for about 33 miles. Past the Ochoco Divide and before milepost 52, take a sharp left onto Forest Service Road 650. The road dead ends into the Cougar East trailhead after about 200 yards.